Monarch Butterflies have begun to return to our gardens again this year. Monarchs require Milkweed for their caterpillars. 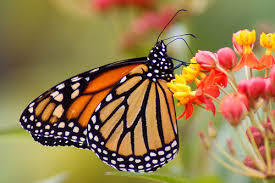 As a matter of fact, Monarch caterpillars can only feed on Milkweeds and nothing else. The adult Butterflies, however, need nectar all summer long. According to National Geographic, Fewer monarch butterflies are crossing North America to winter in Mexico, and the biggest culprit seems to be the disappearance of milkweed in the United States. The trend is particularly troubling because monarchs have long been considered both an indicator of our ecological health and a representative of pollinator populations. When planting for Monarchs, mix Milkweed with lots of flowering nectar plants (as well as grasses) that will bloom from early in the summer (when Monarchs first arrive) through the fall. 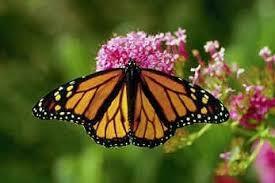 Provide nectar for the Monarchs, along with many butterflies and pollinators, when the Milkweed are not flowering. Each species of Milkweed only flowers for about a month. The adult Monarchs need nectar from the time they arrive until they leave. Create a sustainable ecosystem in your home garden. Support not only the struggling Monarch, but many species of Butterflies, Beetles, Moths, Birds, Snakes, Turtles, and Mammals…etc. 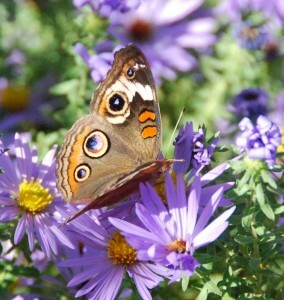 Create a beautiful butterfly garden for your enjoyment. What kind of Milkweed should you plant? Plant Milkweeds native to your area and adapted to your soil and sun conditions. Monarchs can use ALL of them. There are about 75 species of Milkweed found in North America. There are a lot to choose from. You can find out what species are native to your area at the Biota of North America Program (http://bonap.net/NAPA/TaxonMaps/Genus/County/Asclepias ). Email KW Landscaping for more information and to inquire about integrating monarch attracting milkweed into your summer garden. Let’s make Maryland a Monarch friendly stop for our traveling butterfly friends. Did you know that Asclepias, commonly referred to as milkweed plants, are vitally important to the existence of the Monarch Butterfly? Asclepias are the ONLY plant that monarch caterpillars can feed on. No Asclepias, no Monarchs. There have been reportedly less Monarchs than usual last year in the Northeast. The environmental factors including pesticides and habitat loss in the Midwest are hard for us to control here in Maryland but once the monarchs get here, we CAN provide them with larval plant food and then plenty of nectar. Please consider adding this fragrant plant to your garden to not only help sustain the Monarch population but attract these marvelous creatures to your own backyard. There are a number a beautiful colors to choose from including pink, white, purple and orange butterfly weed. Email KW Landscaping for more information on how to add this to your garden in time for the incoming Monarch migration, currently headed our way. click here to see the Monarch’s migration by region. KW Landscaping can order the milkweed plant and have it ready for your garden in 2-3 days. Have you seen a Monarch yet in Maryland this year? The Butterfly Bush: A Native Beauty or a Foreign Flora? Think the butterfly bush would be a great addition to your Maryland garden? Think again. This enlightening article highlights many other good plant choices for attracting butterflies and birds to your garden. You may also call KW Landscaping for a native Maryland butterfly garden possibly featuring the aromatic aster featured in this photo.